Today is my favorite holiday all year – not surprising that I look forward to a holiday focused on food, huh? 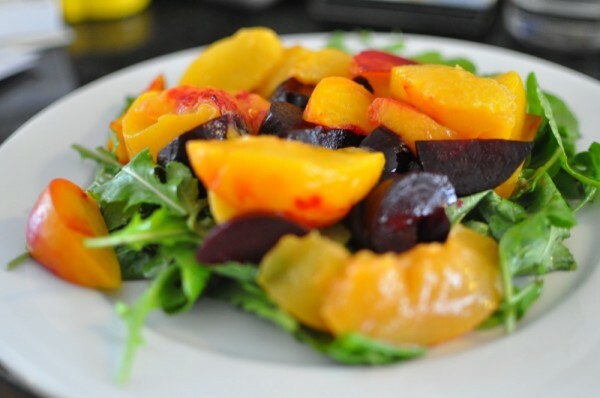 I LOVE the traditional Thanksgiving dinner, but before you dive head first into a plate of brown-ish, carb-y, gravy-soaked dinner, consider a colorful “pre-game” salad. This one comes together in a jiffy after the beets are roasted (which you could do a day or so ahead of time) and is jam-packed with peppery, mildly spicy, and sweet ingredients. This is based on a recipe from Not Eating Out in New York, but modified to use ingredients that we had on hand or found at the Somerville Winter Farmers Market on Saturday. Wash and dry the beets. Wrap each in foil and put in a single layer in a baking dish. Roast at 400 degrees for 40 to 60 minutes, depending on size. The beets are done when they’re easily pierced with a thin knife. Once they’re cool enough to handle, rub the skins off with a paper towel. Your hands will get red, but if you wash them right away, they shouldn’t stain. Slice each beet into 4 or 8 wedges, depending on size. Set aside or refrigerate for a few days, if you do this ahead of time. Whisk the lemon juice, chile, dried basil, salt, and pepper in a large bowl. While whisking, add the olive oil in a slow, thin stream. Doing it this way will help it combine with the lemon juice, rather than forming little pools on top. Add the arugula to the bowl and toss to coat all the leaves in dressing. 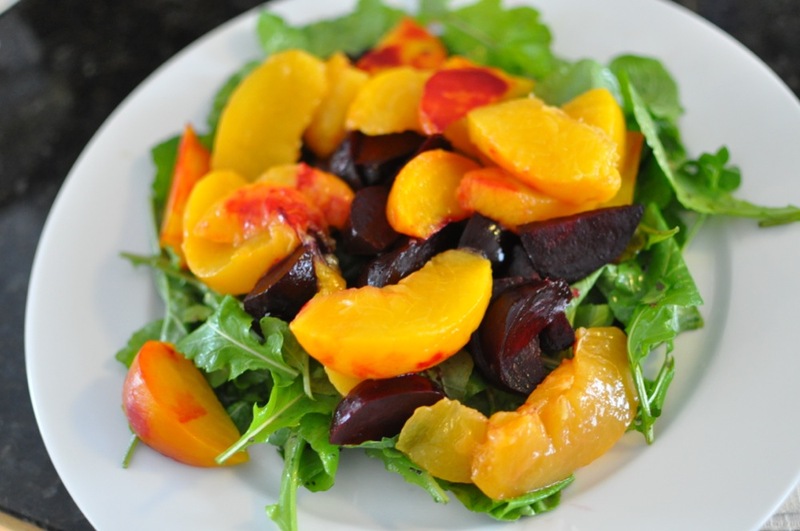 To serve, put a pile of arugula on each plate and arrange the beet and peach slices on top.